Threat Risks vs. Opportunity Risks: Are they the same thing? Author Mike ShuttleworthPublished on 21/05/2017 17/10/2017 Leave a comment on Threat Risks vs. Opportunity Risks: Are they the same thing? A short while ago, I read through a presentation which seemingly tried to convince me that the only difference between threat and opportunity risks was the sign of the impact. That is, threat risks result in negative impacts and opportunity risks result in positive impacts. This, along with another statement in the presentation which read, “Not identifying and capturing opportunities means GUARANTEED FAILURE” (in bold-caps no less) disturbed me to such a degree that I finally decided to crawl out of my risk management closet and publish my own take on these two assertions. Firstly, let me say that I am in no way trying to discourage the pursuit and taking of opportunity risks. Society, industry and life in general would just not be where it is today were it not for mankind continuously seizing opportunities and making the most of them. Many failed, but many also succeeded, and this is what has kept us evolving and developing since we first emerged as the confused, knuckle-scraping homo-sapiens that we were some two hundred thousand years ago. However, seizing opportunity risks does, in my opinion, need to be exercised with some degree of caution, and not identifying or capturing these opportunities certainly does NOT result in guaranteed failure. So, to say the only difference between threat risks and opportunity risks is the sign of the impact is, I find, a rather simplistic and misleading statement. Carrying out the work with different equipment is likely to require a change in execution procedures to ensure the new equipment can complete the job safely, efficiently and within project quality standards. Carrying out the work with different equipment is likely to require a review of operator certification and may result in re-training requirements. Carrying out the work with different equipment may result in site access and security issues. Commencing the work ahead of schedule may result in multiple interface clashes with other work scopes and schedule activities. Completing the work ahead of schedule may result in preservation issues if the original plan was to hook-up, commission and energise the installed materials immediately after the activity was complete. All of this would necessitate a formal Management of Change process to be undertaken with a review of the new equipment specifications, revisions to technical documentation and procedures, re-evaluation of operator credentials, another site survey to be conducted, a review and revision of the project schedule, identification and coordination between all interfaces etc. If, at any point during these revisions and reviews, it became evident that more serious threat risks were now exposed, the project would have to consider scrapping this opportunity and reverting to the original plan which, if any hasty decisions had been taken in trying to exploit this “opportunity”, could result in the original plan no longer being viable. Now, as I said earlier, I’m not trying to pour cold water over the enthusiasm for embracing opportunity risk, far from it. I firmly believe that projects should grasp opportunities wherever they can, but this needs to be done in an environment where the opportunity risks can be properly evaluated, planned, controlled and managed without disrupting existing project activities. Attempting this during the execution stage of large, complex projects with multiple interfaces and overlapping activities generally opens up a very large can of worms in my experience. For these types of projects, I maintain that the best way to achieve project success is by sticking to the old mantra of: “Plan the work, and work the plan”. 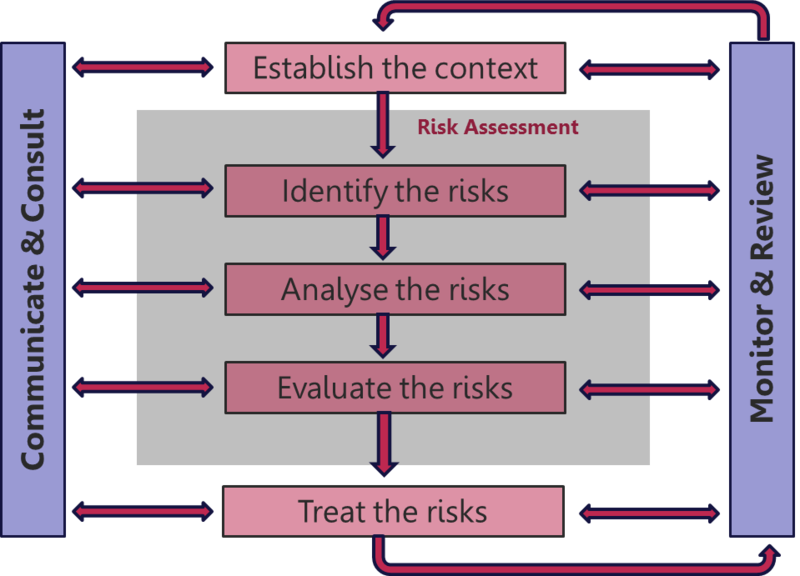 Even though opportunity risks may share the same basic ISO 31000:2009 management process as threat risks (see process flow diagram at the top of this article), the way in which opportunity risks need to be assessed and managed within this process is significantly different from the way threat risks are assessed and managed.